Ah, Valentine's Day, and who better to spend it with than Nigella Lawson? Damn! I mean your loved one, of course. But what better to serve them than an unctuous, decadent, over the top, Nutella cake (the recipe is here) from her book, How to Be a Domestic Goddess? 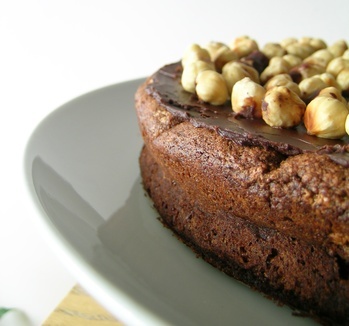 What's so good about torta alla gianduia? Well, it contains a whole jar of Nutella for one. It's also made with a little Frangelico, a lot of hazelnuts, and a generous amount of melted dark chocolate. Of course, if you needed any more reason to like it than, "it contains a whole jar of Nutella," then this is probably not the post for you. I love Nutella. There, I said it. Of all the substances on earth, it's difficult to name one that is as delicious as this hazelnut-chocolate ambrosia. Like most great foods, Nutella has its origins in Italy and, perhaps, its most ardent devotees. We saw this firsthand on our honeymoon. Shortly before our departure, I learned of a café devoted to the product in Bologna, the city in which we happened to be spending the first week of our trip. I'll admit to being a little disappointed with the Nutelleria. I suppose I was expecting some sort of Homer Simpson-esque Nutella dream world, with rivers of Nutella and comically oversized jars that I could bring home for all my friends. What we found, unfortunately, was a shop more McDonald's than Italian café. You'll no doubt be proud to learn that, despite my disappointment, I somehow managed to eat a really fantastic Nutella crepe. Ah, Bologna, non basta uno stomaco. As for the cake, it's damn good too. The crumb is very moist and dense, almost ideal, really. The chocolate ganache icing is smooth, but has a lovely crunch because of the hazelnuts dotting its surface. The only disappointment, for me at least, is that despite an entire jar of the stuff, the cake does not have an overwhelmingly Nutella flavour; instead, the dark chocolate dominates, while the hazelnut elements play a supporting role. This is not to say that the cake is not delicious, it is. As per Nigella's suggestion, we enjoyed a slice with a little Frangelico. Between the alcohol, dessert, and each other's company we were rather content, and isn't that just the way it's supposed to be on Valentine's Day? That is too bad about the Nutelleria - as a Nutella fan myself I think I would have been similarly disppointed to not find Nutella waterfalls. There is a Nutella tart recipe in Pierre Herme's chocolate cookbook - I'm waiting to try that one out! what about the 3.5kg jars of nutella in the supermarkets? i couldn't get over those. Here, here! A perfect Valentine's day treat, in my opinion; especially celebrating the little hazelnut (one of Oregon's specialties). I've been eyeing this recipe myself - so happy to know that it's tasty (though I don't know if I could have doubted that considering it's wonderful ingredients. Gorgeous picture! Happy Valentine's to you and your wife up there in Toronto! Nutella is one of my absolute favourite treats! This cake is definitely on my list. Maybe if you substituted milk chocolate for the dark chocolate, the flavour of the Nutella would come through more? Cheers! I love the reference to the Simpsons' "Land of Chocolate" montage, one of the best ever. I also love Nutella. I also love this post! Happy Valentine's Day to you and Rachel! Nutella is one of my favorite things ever. I can eat it straight out of the jar! Although that cake looks like a pretty good use for it too. Hey there Rob and Rachael! Great job on the blog - I'll definitely try the cake. There was another chocolate mousse cake made with Nutella in the Feb. edition of Gourmet magazine. Anita, I think I need to get my hands on the Pierre Herme's cookbook. Everywhere I turn I keep hearing about it. Cin, I have to admit that 3.5kg of Nutella sounds both delicious and intimidating. I think I'm up to the challenge. Thanks for the Valentine wishes, Michelle, hope you and the Loving Boyfriend has a memorable day too. Ian, on a future attempt I may make the substitution, but I always try my best to stick to a recipe the first time I make it. I'm glad you liked the Simpson's reference, Tania. I sort of had visions of taking about our of a Nutella cafe employee as I was writing that line. Thanks for visiting, From Our Kitchen, and I have to agree with you about eating it straight out of the jar. Actually, Rachel caught me just the other day jar and spoon in hand when she came home frome work. I wish I could figure out why I felt like I'd been caught doing somethin wrong? Hello, Lynn, and thanks for the tip on the Gourmet. We will definitely get our hands on a copy. You are my hero. Nutella is one of the holy foods for me ... I remember being in Italy once summer when I was small and eating it straight out of a tub (they sell it these huge plastic vats) with hunks of warm bread. I as well adore Nigella, and made this sumptuous cake too :) all my roomies and Don adored it. Have you made any other of her chocolately-orgasmic recipes?